The Railway Gazette has hosted this discussion on the HS2, including principal proponent James Steer and a leader of the opponents. Steer puts up a good case but it is the case for building a new railway if demand is not to outstrip capacity. The opponents' argument is that there is plenty of slack that can be taken up by better management of the capacity that already exists, with judicious improvements to the infrastructure at key locations such as Ledburn Junction. Steer suggests convincingly that this will be insufficient to cater for the projected growth. However, that argument is the case for building a new conventional speed railway, not that the new railway should be a high speed line. But a conventional speed railway could provide the same additional capacity, without disrupting existing services, through a rolling programme of reinstatement of the Great Central and its connecting links, substantially on its original trackbed. 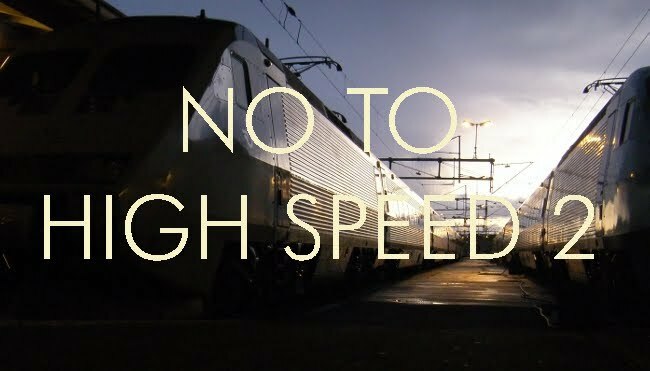 The proposed high speed railway follows the same general alignment but the need to avoid curvature means that it could not use the original trackbed, and additional costs will be incurred. Then there is the cost of the special dedicated fleet of UK gauge stock to run on the high speed line, and the energy costs which increase by a factor of 2 for every 40% increase in speed. It is inconceivable that the cost of building and operating a new line as a high speed railway will be just a little bit more than the cost of building a conventional speed one. What is the point of fining the railways?